Staff and Students at The Maelor School, Penley were delighted at this years’ record A level results. 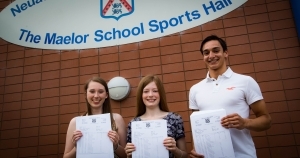 43% of all A levels taken achieved the top grades of A or A*. Headteacher Simon Ellis said “I am delighted with the achievement of these students, we have been working very closely with Oxford and Cambridge university as part of a project called SEREN aiming to stretch the most able and make sure that they reach their potential”.